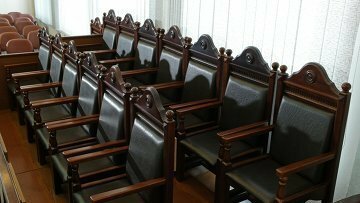 Russian lower house adopts bill extending jury trials in first reading | Russian Legal Information Agency (RAPSI). MOSCOW, October 25 (RAPSI) – The State Duma, Russia’s lower house of parliament, passed in the first reading on Wednesday a bill that envisages a wider use of jury trial institution for certain demographic groups. Amendments to the Criminal Procedural Code of Russia are aimed to implement the decisions of the Constitutional Court regarding the cases in the framework of which the most severe punishments would not envisage life imprisonment or death penalty. According to the bill, these cases may be reviewed by a jury panel. The draft law stipulates in particular that cases against women and men aged 65 and older may be considered by jurors. However, authors of the initiative propose to restrict jury panels from reviewing criminal cases against people under the age of 18. Under the current law, women as well as men over age of 65 cannot be sentenced to exceptional measure of punishment and therefore their cases can’t be reviewed by a jury trial. The Court found that provision to contradict the Constitution and ruled to lift the restriction in order to ensure equal access to justice. 18:00 25/10/2017 The State Duma, Russia’s lower house of parliament, passed in the first reading on Wednesday a bill that envisages a wider use of jury trial institution for certain demographic groups.